NOVENA TO ST VINCENT DE PAUL O Glorious Saint Vincent de Paul, the mention of your name suggests a litany of your virtues: humility, zeal, mercy, self-sacrifice. It also recalls your many foundations: Works of Mercy, Congregations, Societies. The Church gratefully remembers your promotion of the priesthood. Inspire all Charitable Workers, especially those who minister, to both the spiritually and the materially poor. 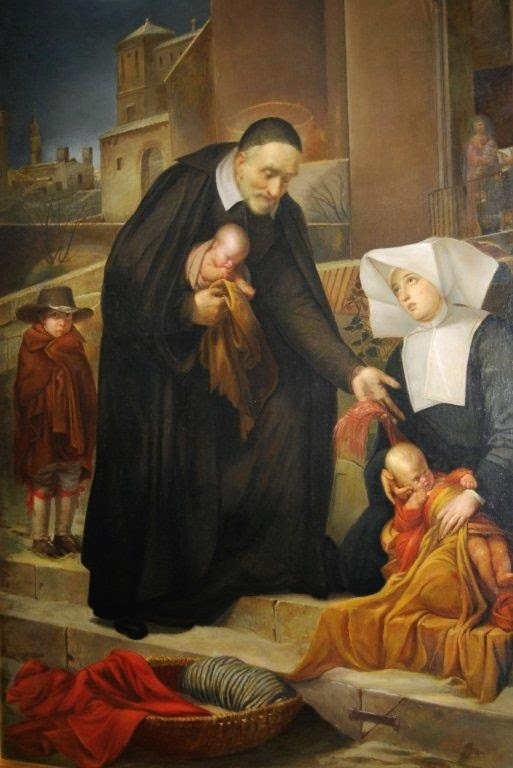 O Lord, give us the grace that You bestowed upon, your servant St. Vincent de Paul, to relinquish the temptation of material things, in our holy effort to minister to the poor. Amen. The Litany of St. Vincent de PaulFor Private Use Only. Let Us Pray: O God, Who by an effect of Thine infinite goodness, hast renewed in our days, in the apostolic character and humility of Thy blessed servant Vincent, the spirit of Thy well-beloved Son---to preach the Gospel to the poor, relieve the afflicted, console the miserable, and add new luster to the ecclesiastical order---grant, we beseech Thee, through his powerful intercession, that we also, delivered from the great misery of sin, may labor to please Thee by the practice of the same humility, through Jesus Christ Our Lord, Who liveth with Thee and the Holy Ghost, ever one God, world without end. O God, Who for the preaching of the Gospel to the poor, and for promoting the honor of the priesthood, didst endue blessed Vincent with the zeal of an apostle, grant, we humbly pray Thee, that we who venerate his holy life may profit by the examples of virtue he has left us. R. Amen.